On 17 April 2015 Member States agreed to the Commission's proposal to postpone the phase-out of inefficient "D"-class halogen lamps by two years to 1 September 2018. The vote was preceded by a thorough review process open to the public, examining the best way forward. Many stakeholders contributed actively to this assessment, such as Members of the European Parliament, Member States authorities, the lighting industry, consumer organisations and environmental NGOs. Why are certain halogen lamps being phased-out? Halogen lamps are very inefficient (energy efficiency class "D"). Novel technologies, such as LEDs offer a high savings potential: the consumption of a halogen lamp is often more than five times higher than the one of an energy-efficient LED. 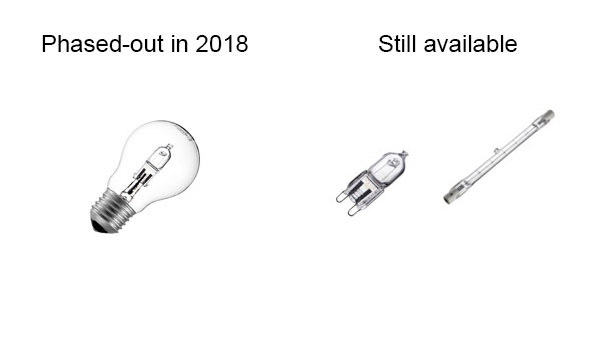 As a result, Member States agreed in 2009 that such inefficient "D"-class halogen lamps should be phased-out from 1 September 2016.
halogen lamps; a more appropriate phase-out would be 2018. Member States have now approved this two-year prolongation. This phase-out in 2018 will have the advantage of offering greater monetary savings for European consumers and help the environment. This is in line with the Energy Union priority of improving Europe's energy efficiency, with the final goal of ensuring secure, sustainable, competitive and affordable energy. In fact, everyday the European Union pays over 1 billion Euros for its energy imports. This is reflected in the high electricity and fuel prices all Europeans pay, but it also has implications for the EU's security of energy supply. What changes exactly on 1 September 2018? From 1 September 2018 onwards, some non-directional mains-voltage halogen lamps (mainly the pear-shaped ones) will no longer be brought to the market. The measures will not apply to products that are already on the shelves in stores, but only to new products being offered for sale. The postponement of the phase-out received favourable support from the majority of Member States, as well as from consumer organisations. Postponing the phase-out will bring more efficient products to the market, and give consumers the possibility to choose the best performing lamp for their needs. Switching from an average halogen lamp to an energy efficient LED will already save approximately 115 Euros over the LED's lifetime of up to 20 years, and pay-back its cost within a year. This savings will increase further by 2018 with lower LED prices and a better LED performance. The switch to energy-efficient lamps in 2018 will bring yearly energy savings equal to the annual electricity consumption of Portugal (48.0 TWh of electricity) and will save 15.2 million tonnes of CO2 emissions by 2025, equivalent to the emissions generated by around two million people per year. This means, reducing the EU's import of oil by 73.8 million barrels. Compared with a phase out in 2016, as previously foreseen, EU consumers would have lost one billion Euros of these savings. Everyone agrees that a maximum of around 6,800 job losses in halogen lamp production are inevitable and will happen irrespective of any policy intervention due to the arrival of LEDs. The phase-out of halogen lamps and faster market uptake of LEDs can help overcome some of these negative impacts by focusing on high value creation and employment opportunities in the EU. Deferring the phase-out to 1 September 2018 gives manufacturers the time to create replacement jobs in these areas, while supporting innovative companies in the EU providing novel lighting solutions based on LEDs. avoiding compliance costs with potentially 28 different sets of national requirements. This means significant extra revenue. Moreover, these measures protect EU industry from competition from low-quality and inefficient imported products.